Open shelving provides a combination of an aesthetic focal point with superb functionality. They enable homeowners to showcase a dramatic backsplash, display dishes, pottery, sculptures, plants, herbs, dishware and glassware, and more. Plus, open shelves provide home chefs with the functionality to access their favorite cooking tools within arm’s reach. So, what’ the downside? Open shelves limit storage and can contribute to a cluttered look and feel. Items you want to showcase are uniform in size. You want to easily access the cooking tools that used most often without having to search in a cabinet or drawer. Budgets are tight. Shelving tends to be less expensive than cabinetry and less costly to install. You want to showcase a backsplash, collectibles, artwork and dish and glassware. Space is at a premium. Open shelves can make a kitchen appear larger and more open. You don’t have the time or the inclination to keep the shelves organized. You don’t have the time or the inclination to clean often (they tend to attract dust, grease and grime generated from cooking). You are seeking custom design on a budget. There are too many items on the shelves that contribute to a cluttered, disorganized look. 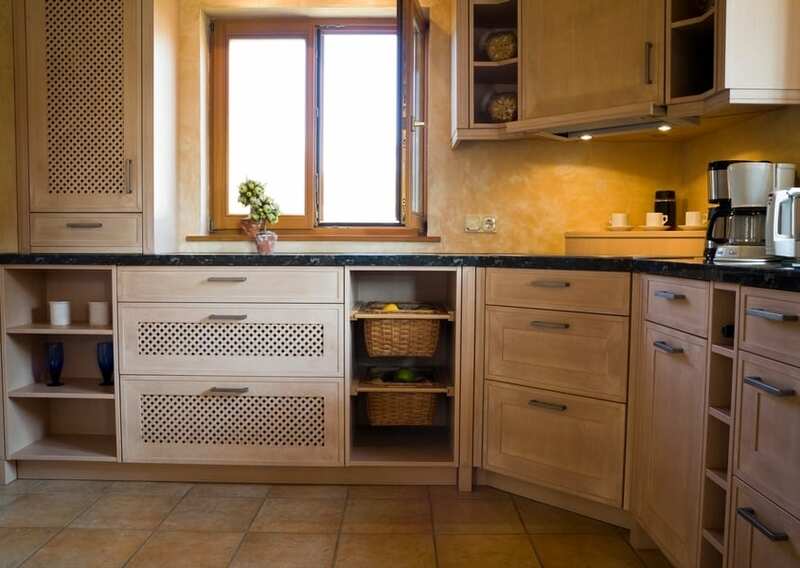 You need the storage space that cabinets provide. Upper cabinets conceal clutter and disorganized dishes that you may not have time to straighten up. Upper cabinets help keep things tucked away and off the countertops. Not sure? There are many cases when you can combine cabinets with open shelves. Are open shelves a feature that will work in your new kitchen? Give us a call at 401-463-1550 or visit our showroom at 139 Jefferson Boulevard, Warwick, RI to determine how you can create the kitchen of your dreams.